Robin Youngs, Edward Fisher,	The Journal of Laryngology & Otology, Volume 128 Issue 8, p 659. P C L Pinto, C M Marcelos, M A Mezzasalma, F J V Osterne, M A de Melo Tavares de Lima, A E Nardi,	The Journal of Laryngology & Otology, Volume 128 Issue 8, pp 660-664. Patric Blomstedt,	The Journal of Laryngology & Otology, Volume 128 Issue 8, pp 665-668. I Dallan, S Fortunato, A P Casani, E Bernardini, S Sellari-Franceschini, S Berrettini, A Nacci,	The Journal of Laryngology & Otology, Volume 128 Issue 8, pp 669-673. S Yetiser, D Ince,	The Journal of Laryngology & Otology, Volume 128 Issue 8, pp 674-678. Y Zhang, K Y Li, C Jin, Y T Wang, L Geng, Y J Sun, H C Tian, J Q Liu, X J Jin,	The Journal of Laryngology & Otology, Volume 128 Issue 8, pp 679-689. Bone cement: how effective is it at restoring hearing in isolated incudostapedial erosion? 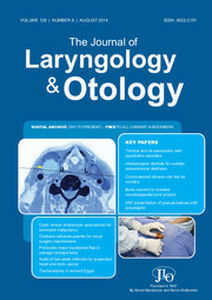 G J Watson, S Narayan,	The Journal of Laryngology & Otology, Volume 128 Issue 8, pp 690-693. N D Sonbay, C Saka, S Tatlican, E Vuralkan, N Aygener, C Eren, I Akin,	The Journal of Laryngology & Otology, Volume 128 Issue 8, pp 694-697. C Cevik, O Aycan Kaya, E Akbay, E Yula, E Yengil, M I Gulmez, E Akoglu,	The Journal of Laryngology & Otology, Volume 128 Issue 8, pp 698-701. G Malkoc, A Dalgic, M Koc, T Kandogan, S Korkmaz, M E Ceylan, S Inan, L Olgun,	The Journal of Laryngology & Otology, Volume 128 Issue 8, pp 702-708. S Al-Shaikh, A Muddaiah, R J Lee, M F Bhutta,	The Journal of Laryngology & Otology, Volume 128 Issue 8, pp 709-713. E Cömert, Ü Tunçel, M Taner Torun, C Kiliç, A Buğra Cengiz, Z şencan, M Kaya,	The Journal of Laryngology & Otology, Volume 128 Issue 8, pp 714-719. C Williams, R Byrne, D Holden, I Sherman, V R Srinivasan,	The Journal of Laryngology & Otology, Volume 128 Issue 8, pp 720-724. A L Hamdan, A Dowli, R Barazi, J Jabbour, S Azar,	The Journal of Laryngology & Otology, Volume 128 Issue 8, pp 725-729. M Martinez Del Pero, D McKiernan, P Jani,	The Journal of Laryngology & Otology, Volume 128 Issue 8, pp 730-737. F Safiruddin, D L Mourits, N de Vries,	The Journal of Laryngology & Otology, Volume 128 Issue 8, pp 738-741.